Caught between being a tearjerker and heartwarming is the real life story of the tragic end of little boy’s life that may have saved up to 25 lives by donating his organs. Consumer advocate and journalist Christopher Elliott shared a true story of a young boy who was brutally murdered and a nameless pilot who was a hero. Nancy is one of his loyal readers and she sent him this emotional story that you can read in full here. In the morning, her husband arrived two hours early at LAX airport to discover the baggage check and security check lines were tremendously long. He knew he wasn’t going to make it through them in time to catch his flight. Heartsick about his grandson and worried about his daughter, already on the verge of tears, he kept pleading with TSA and Southwest employees to fast track him through so he would make the flight. Even though he explained over and over that this was his last chance to see his grandson, not one person seemed to care and no one helped him. Several minutes past the plane’s departure time, he cleared security. He grabbed his computer bag, shoes and belt, and ran in his stocking feet to his terminal — where the pilot and Southwest ticket agent were waiting on him. After Elliott wrote to Southwest, the airline said it was “proud” of the pilot instead of punishing him for holding up a flight. There is no good news when a three-year-old, or anyone for that matter, is brutally murdered. It’s tragic. By donating his organs, however, 25 people who were waiting for organs, some of whom would otherwise die, were given the greatest gift — a chance to live. The organ donor system is far from perfect, but if you are so inclined, you might consider saving lives by registering to be an organ and tissue donor with your state registry. Why is the pilot a hero again??? The Pilots’ help is a one in a million. I wonder how the pilot found out when none of the TSA/Southwest people cared. I think the story is missing something big. Even though it paints as the TSA and the others at southwest as “not one person seemed to care and no one helped him”, there is no way the pilot would have even known the situation if it wasn’t for the Southwest ticket counter employees or even the TSA. The pilots don’t personally know anyone’s story and are blissfully unaware of passenger problems. Someone from Southwest advised the gate agent of the situation. The gate agents were the ones that probably held the plane for the passenger and decided with the pilot. But the story paints it like everyone else was an a hole and the pilot was this glowing hero. I think any reasonable person/pilot would have done the same thing had they known about the situation. I guess it’s good for everyone to think of the glowing pilot with his shiny pilot wings making these decisions. 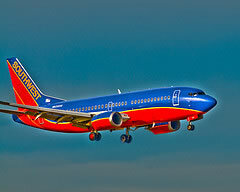 In reality it was the Southwest customer service agents that were the REAL heros. Thanks to the author for screwing up the story. While I agree that the pilot could not have known the situation without the help of other Southwest employees, I think that it is unfair to only attack the author of this post. If you read the original articles or watched the news coverage you would know that almost if not all media outlets focused on the pilot. Do I think other employees that were involved in this situation should be acknowledged, absolutely! What a great act of kindness. But let’s blame all media outlets for that making that mistake. you are the man and without question so is the pilot. I feel nothing short of pride and admiration for the pilot of that flight. I understand the pressure a pilot has for an on time departure. It certainly restores my faith in human compassion.